Blue Chalk Media is an award-winning production company founded by people who believe in the power of nonfiction visual storytelling. Since our founding in 2013, we’ve produced over 700 videos and garnered more than 100 awards for clients such as Time Inc., Carnegie Corporation of New York, the higher education division of Pearson, the Food Network and marketing agencies or companies such as Siegel+Gale, T Brand Studio of The New York Times, Nike, and over 95 others. 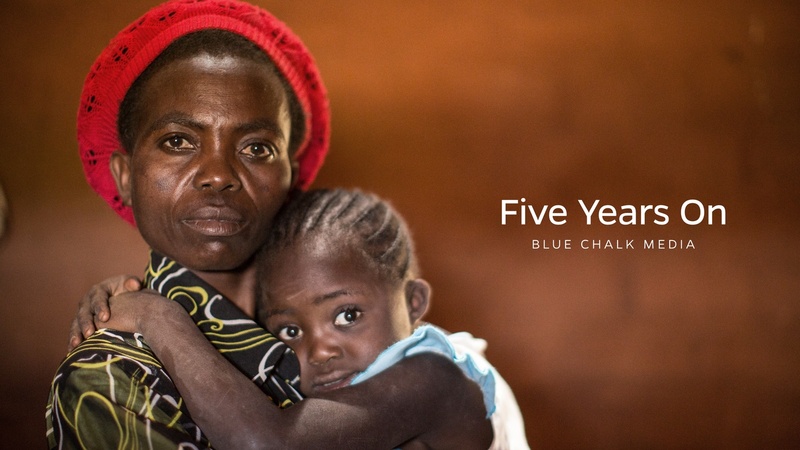 Blue Chalk operates around the world having completed projects on six of the seven continents. While recognized for its cinematic videography and editing, the heart of all Blue Chalk creative is the care taken in choosing characters whose stories are authentic and powerful. The goal is to apply the techniques and perspectives of the documentary filmmaker or photojournalist to all the work we do. The first documentary feature film from Blue Chalk releases in 2019. While focused on visual storytelling, Blue Chalk is opening a new division of the company to produce nonfiction audio podcasting. This initiative, called Earful: Audio from Blue Chalk Media, offers us the opportunity to tell stories in an intimate and engaging medium that is sure to grow in influence for years to come. Blue Chalk is headquartered in Brooklyn, NY, with additional offices and production facilities in Portland, OR. From Africa to Europe—scroll through some of the images we've captured while on assignment around the world. Greg Moyer is an award-winning television and digital media executive with deep international experience and a track record of innovation in channel design, brand positioning, programming, marketing and global distribution. A creative and inspirational leader, Moyer has successfully operated across senior positions for Discovery Channel, TLC, Animal Planet, VOOM HD and Food Network, among others. Moyer led Discovery in collecting five George Foster Peabody Awards for programming excellence. Pam Huling, one of the original founders and a part-owner of Blue Chalk, is responsible for all of the corporate operations for the company, including business development, corporate culture and human resources, technical systems, project workflow and communications. Previously, she led business development at a pioneering visual storytelling startup in Brooklyn and also founded two consumer cloud services, partnering with a progressive tech firm in Switzerland. Huling started her career as an intern at Discovery Communications, LLC, now the global leader in Real Life Entertainment, and rose quickly to become the Director of Photo Services where she oversaw all aspects of photography, supporting more than 100 television brands worldwide for nearly 15 years. Currently, Huling is an adjunct professor in the Visual Communications department at Syracuse University's Newhouse School. She is a graduate of New England Conservatory of Music, having received a scholarship at the age of 17, and has a degree in graphic design as well. Rob Finch is a Portland, OR-based visual storyteller who has won multiple prestigious awards. Finch was part of a team from The Oregonian, where he worked previously, recognized with the Pulitzer Prize in 2007. He has also won the Online Journalism Award for Best Video Presentation and has been a two-time Newspaper Photographer of the Year in the Pictures of the Year contest. He was selected to exhibit his work in Perpignan, France at the Visa pour l’Image Festival and was a member of the World Press Masterclass. Photo District News named him one of 30 Emerging Photographers to Watch. Greg Snider is an award-winning editor based in Portland, OR. His work includes the HBO documentary feature film, "How to Die in Oregon," winner of the Sundance Film Festival Documentary Grand Jury Award and the Karen Schmeer Award for Excellence in Documentary Editing, and the influential eco-biography "The Real Dirt on John Farmer,” winner of the Audience Award at Slamdance, among others. His latest editorial achievement is the documentary feature, "The Winding Stream: The Carters, The Cashes and The Course of Country Music." In addition to his feature film work, Greg has edited many films for the National Park Service. Natalie Taylor is a producer based in Portland, Oregon, who loves researching and conveying stories about ways people interface with science and the environment. Before embarking on a career in visual science communication, she studied zoology and worked for five years in a microbiology lab at Duke University helping to develop a combined vaccine for tuberculosis and HIV. She completed her master's degree in visual communication at the University of North Carolina at Chapel Hill School of Journalism and Mass Communication in 2014. At UNC, she contributed to two award-winning projects, Living Galapagos and Powering a Nation: Over Water Under Fire. She is a leader with the group Scientists with Stories, a science communication program. Jason Greene is an award-winning cinematographer and filmmaker interested in social issues and the collaborative nature of filmmaking. He recently finished his master's degree in photography, multimedia and design at the Newhouse School at Syracuse University. He was the director of photography for “55 Days,” a film about a war widow learning to let go of her loss, and a cinematographer for “Canyon Song,” with National Parks Experience, a film about two young sisters learning about their Navajo culture and history within the sacred walls of Canyon de Chelly National Monument. Additionally, he is the multimedia director at TakingFocus.org, a nonprofit organization dedicated to giving back through documentary storytelling. He is passionate about the storytelling nature of cinematic visuals—striving to make those visuals lyrical and honest. He is currently based in Portland, OR. Megumi Nishikura is passionate about addressing our global and social issues through documentary storytelling. Before starting at Blue Chalk she spent five years working for the United Nations, producing and directing documentaries on environmental issues such as climate change and biodiversity loss. Believing in the healing power of storytelling, Megumi has captured stories of 9/11 survivors and those impacted by the 2011 Tsunami in northeastern Japan. Her award-winning independent film, "Hafu—the mixed-race experience in Japan" screened theatrically throughout Japan and aired in the U.S. on PBS. Sarah began her film career at Film Forum in NYC. After relocating to Portland, she worked for the Northwest Film Center where she created three short films that went on to receive awards at the Northwest Film & Video Festival. While at the center, Sarah also worked as an artist in residence and founded the “Flicker Film Club for Teens.” In 2001 she established the video department at Portland State University as an adjunct professor, while also working as an instructor and post-production supervisor for feature-length documentaries at the Digital Media Education Center. In 2007 she found her calling as an editor, helping clients such as Wieden + Kennedy, Laika, Swift, Nike and Adidas. Outside of work, some of her favorite things include jokes, creative collaboration and dance parties with her daughter. Ruth Aravena is a communications and digital specialist with a passion for social media. Originally from Dublin, Ireland, she received her M.A. in Journalism from Dublin City University and has previously interned as a multimedia journalist in RTÉ, Ireland’s national broadcaster, and The Guardian in London. Prior to making the move to New York City, she worked as social media manager and in-house blogger for Ireland’s leading travel PR agency. Outside of work, she likes to spend time devouring documentaries and exploring the hidden gems of New York City. Jesse Crowell is a filmmaker focused in documentary storytelling. He completed his journalism degree at the University of Oregon in 2014. While attending UO, Jesse collaborated on two award-winning multimedia projects, “Into The Evergreen,” which profiled people with deep connections to Oregon’s forests, and “Science and Memory,” which reported on how climate change has impacted a small town near Alaska’s Copper River Delta. His interests have led him across the world as a photographer, writer, designer, and director. Jesse is a native Oregonian currently based in Portland. Sebastian grew up in New York City drinking coffee, playing the violin and watching Bette Davis movies with his dad. He studied film and music performance at Vassar College before returning to the city to manage and produce multiple award-winning films, television programs and short-form content for networks such as Showtime, History Channel, CNN, ESPN, Hulu and Maker Studios. His projects have premiered at film festivals such as Sundance, Toronto, Tribeca and SXSW. He recently produced the music documentary "The Art of Listening" for Sony as well as short films for the series "We The Voters." A recent transplant to Oregon, he continues to play the violin and enjoys working on his screenplays late at night. Eric is a Portland, OR-based video editor, motion graphics artist and post-production specialist. His career began in 2008 at Radical Media’s post-production facility, Outpost Digital, in New York. While there he supported world-class editors and assisted in editing the Academy Award-nominated documentary “Paradise Lost 3: Purgatory”. Following this, he spent several years working with advertising agency Wieden+Kennedy New York. In 2013, Eric followed his heart to Portland where he worked as a freelance video editor for clients such as Nike, Adidas and various regional agencies. When he’s not editing he enjoys spending time with his wife planning adventures for their mini Goldendoodle, Murphy. Mariko is a writer, editor, and project manager who has worked in academic publishing and educational assessment for more than two decades. Before joining Blue Chalk, Mariko was managing editor of Thomas Riggs and Company, a book development firm, and worked with such clients as Gale, Chadwyck-Healey, and McGraw-Hill Education. After earning a language degree from UC Berkeley, Mariko went on to Eastern Washington University for an MFA in creative writing. Her passions include sewing, knitting, and trail running. Amy Polansky is the product of an english professor and a historian, raised to harbor a deep appreciation for archaeology and all things sci-fi. Originally from the Midwest, she set out for the West Coast to manifest destiny—and found herself in advertising. With a background in post-production, Amy has worked on a number of award-winning campaigns and has produced work for Nike, Lululemon, Adidas, CLIF Bar & Co., and Rocawear along the way. Amy is extremely passionate about creating content that both educates and inspires. In her free time, she enjoys combing record shops for long lost UK Garage tunes, dabbling in amateur woodworking, and devouring historical reenactment. Maria grew up in many different places, finding dogs to befriend and hikes to hike wherever she lived, whether it be Eastern Washington, Southern Indiana, or Northern Sweden. She graduated from Carleton College in Minnesota with a degree in Environmental Studies and landed in the Pacific Northwest with a pair of hockey skates in hand as memorabilia of frigid winters past. After pursuing further education in photojournalism at the University of Oregon, she moved to Portland to work at Blue Chalk and to be closer to Powell’s City of Books. She aspires to one day play in a synth band. Kylie is a producer and editor based out of New York City. She grew up in Portland, Oregon, where her visual media career began with claymation and sticky note stop-motion videos. Now, Kylie produces and edits both branded content and journalistic pieces for Blue Chalk Media in addition to personal projects for organizations such as the Washington Department of Corrections. She focuses on creating character-driven content that is both of the moment and evergreen. Outside of work, you can find Kylie brewing kombucha or searching for airplane tickets to somewhere sunny. Matthew Slutsky loves a good story and has worked for years to tell as many of them as he can. Matthew started his career working in politics and on numerous issue advocacy campaigns and this work eventually led him to become one of the founding members of Change.org, the largest social action platform in the world. After many years of service there, Matthew made the leap to non-fiction storytelling and pursued a masters certificate from The New School in New York City in documentary filmmaking. Matthew serves in a dual capacity at Blue Chalk helping to develop new projects as well as producing. Matthew recently moved to Philadelphia, PA where he lives with his wife, young son and daughter, and a highly excitable sheepdog. Whitney is a specialist in human connections. Growing up in Springfield, OR, surrounded by her ten siblings she learned the importance of persistence and working towards seemingly unreachable goals. Her passion for people of all backgrounds landed her at the University of Oregon in the field of journalism. Now at Blue Chalk Media, she strives to tell inspiring narratives and works with organizations such as the Washington Department of Corrections for personal projects. In her free time, she dreams up new fictional story plot lines, eats a lot of food, reading astronomy blogs and watches the clouds roll by. Eléonore (Léo) Hamelin is an NY-based journalist and producer. At Blue Chalk, she has produced for clients such as The New York Times, Bloomberg Philanthropies and Pearson and has traveled to dozens of far-off destination, including the African continent to interview Heads of State. She's also an Adjunct Professor of Video Journalism at Columbia University's Graduate School of Journalism—where she earned a master's degree in 2012. She has worked with the BBC, The Guardian, Arte, Vox.com and, in 2018, she reported from the U.S.-Mexico border as an International Women Media's Foundation fellow. In 2017, she received a European Journalism Centre grant to report on women's issues in Rwanda. Outside of work, Léo loves plants, the French soccer team and doodling. Chris Janjic is a documentary photographer and filmmaker from Boulder, Colorado. After graduating with a degree in Photojournalism from the S.I. Newhouse School of Public Communications at Syracuse University, Chris worked as First Assistant and Associate Video Producer for Stephen Wilkes Photography. During his time with Wilkes, he was as an Associate Producer on Jay Myself, a feature-length documentary about legendary photographer Jay Maisel that went on to premiere at DocNYC. Chris attended the Eddie Adams Workshop XXVII and has earned recognition from NPPA, NPPF, Associated College Press, Hearst and PDN. We're always looking to work with people who share our values—people who are both talented individuals and excellent collaborators. If you don't see a job listing below that suits your skill set, please fill out our creative partners interest form to let us know more about your background and skills. And don't forget to follow us on social media to be the first to know about job new openings.